Durability, functionality, fun and safety are particularly important to KETTLER, especially when it comes to kids ride-ons. 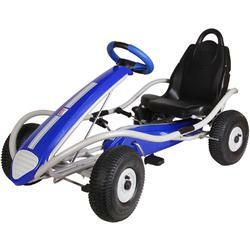 The KETTLER Kiddi-o Sport Kid Racer Pedal Car in high carbon steel frame with fade resistant powder coat finish features durable Lo-Pro wheels with real rubber tread, 3 position easy adjust high-back racing seat, and coasting shifter. Safety enhancements include fully enclosed chain guard and dual rear wheel hand brake. Seat to Pedal: 22" to 25"